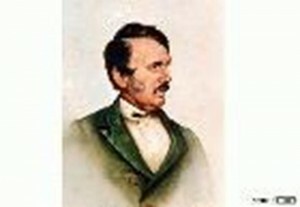 David Livingstone, the famous missionary and explorer, had family connections with the Isle of Ulva, off the west coast of Mull. His father’s family came from Ulva, but David, himself, visited Ulva only once, in 1864. He came by yacht (belonging to a friend) in the hopes of finding some evidence of his grandfather, but he neither heard nor saw anything. David’s grandfather, who remains un-named, had left Ulva in 1792 in the search for employment. He ended up in Blantyre in Lanarkshire where he found employment in a cotton factory. Grandfather Livingstone was a well-respected man in Blantyre, known for his determination to push forward the education of his children, including David’s father, Neil. Other close members of the Livingstone family must have left Ulva at around the same time, resettling in Canada, Prince Edward Island and the United States. In the early nineteenth century Ulva’s main crop was potatoes. It was such a successful crop that potatoes were exported – presumably to Mull – but in the 1840s the crop failed as a result of blight and many islanders had to leave Ulva in order to survive. Throughout the eighteenth and nineteenth centuries, seaweed was gathered for use as a fertiliser on the crofts. It was also used more and more, and in huge quantities, in various chemical processes, such as soap and glass making. To make the kelp useable it had to be dried out and carefully burned in a kelp pit, trench or kiln. The resulting ash was an oily bluish substance, which was shipped away to factories in the Lowlands. Kelp was a crucial livelihood on Mull and Ulva, but after 1822 the duty payable on cheaper, imported kelp was removed, and the Scottish industry largely collapsed. This collapse precipitated another exodus from Ulva. The once thriving community was then further reduced when sheep were brought in to replace the lost income from kelp. David’s father, Neil Livingstone, became a tea dealer, spending all his life in either Blantyre or Hamilton. However, David had grown up amongst the Blantyre cotton-weavers, which must have helped when he had to converse with the chiefs of the African tribes he met as a missionary. More information about the Livingstone exhibition and his missionary work in Africa can be found here on the National Library of Scotland website.